Our garden seems to choose every year what it will do well and what it won’t. One year, it was zucchini. Another year, basil. This year seems to be tomatoes. So with the overabundance of tomatoes and a few small basil leaves, we wanted to make something that would be quick and easy and not super hot, since of course it’s late August in Missouri. Luckily, J found this super simple recipe on the Food Network. We’ve talked about how we love lots of Emeril Lagasse’s dishes before (here, here and here) and he did not disappoint this time either. Put a large pot of salted water on for the pasta. Meanwhile, prepare your sauce. In a large skillet, heat 1/4 cup of the olive oil. Add the garlic and cook until just fragrant, about 1 minute or less. Add the tomatoes and cook for 3 to 5 minutes, just until they begin to release some of their juice. Cook the pasta in the pot of salted boiling water for 12 to 13 minutes until al dente (you're best bet is to follow the package directions). Drain the pasta. Add the pasta and basil to the pan with the tomatoes and toss. 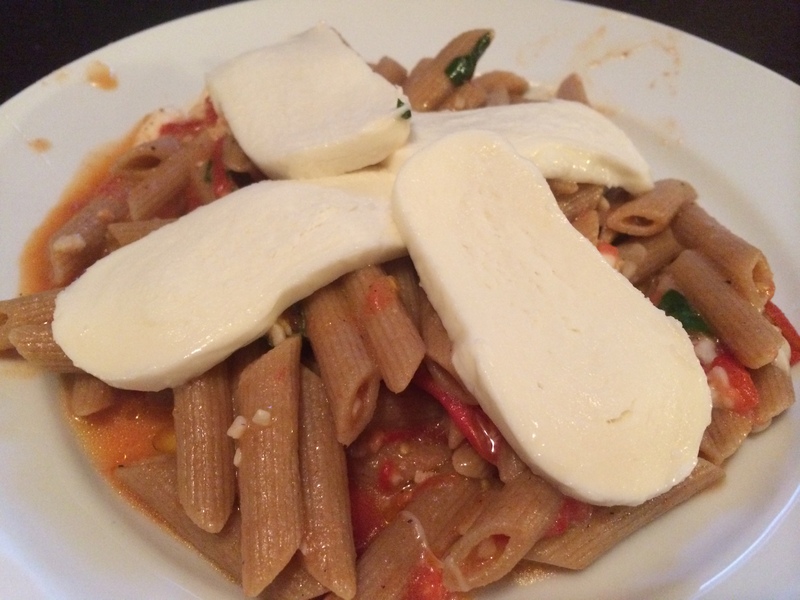 Serve the pasta in bowls, equally distribute the fresh mozzarella between the bowls. Drizzle the remaining olive oil over the bowls of pasta and serve immediately. We reserved some mozzarella to top the pasta and then drizzled it with Balsamic vinegar. So very tasty and perfect for a hot summer evening. Next time we might add additional veggies like onions or zucchini. You may have noticed that whenever we take a vacation, we come back with a recipe. Our recent jaunt to Key West was no different. While we could have come back with a recipe for traditional Key Lime Pie (we did) and the best lime slush (also have that), we really wanted to recreate our favorite lunch at Paseao (which apparently is also in Seattle, who knew?). 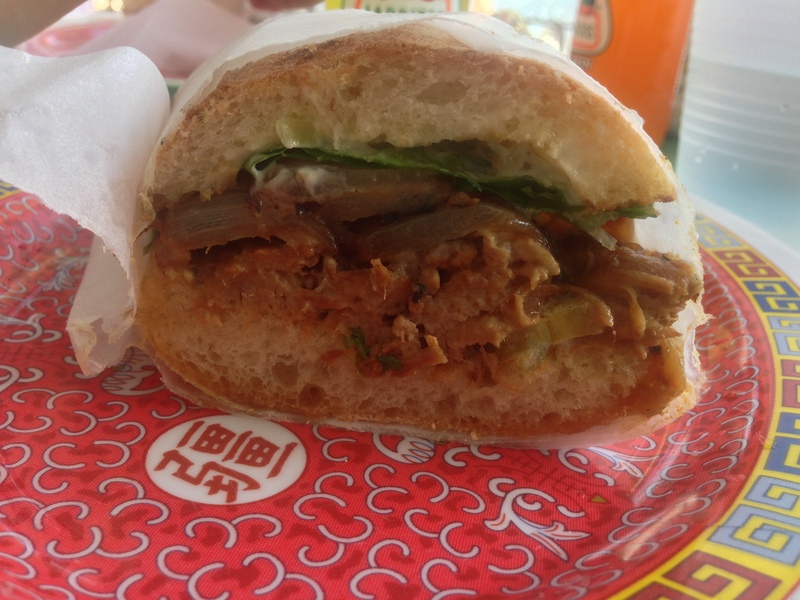 Here’s a picture of the original sandwich. We found a pretty easy to follow recipe and with a few tweaks got our version really close. Finding the mango juice was the hardest part. 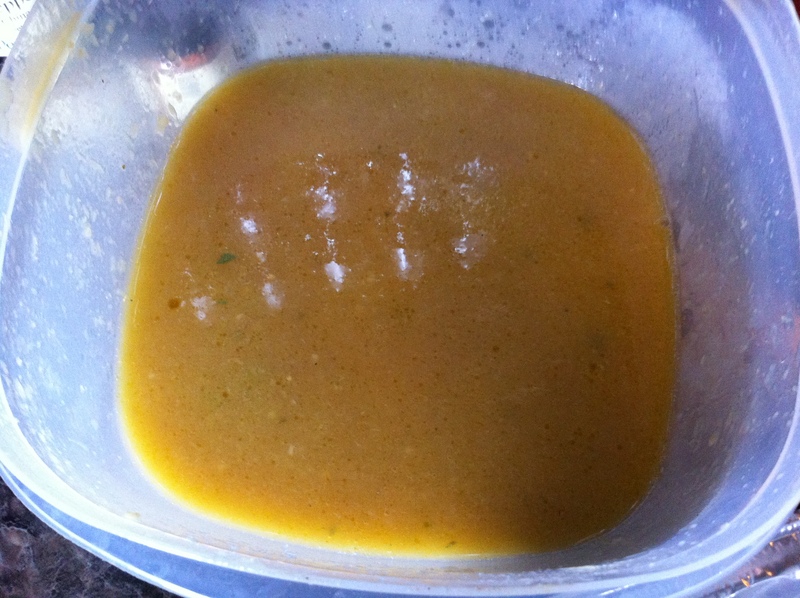 We ended up finding Mango Puree in the natural food section of our favorite grocer. Combine the pork ingredients in a large Tupperware container. Add pork. Seal. Shake. Leave it in the refrigerator for at least 4 hours, the longer the better. We left it in overnight. Preheat the oven to 300 degrees. Remove the pork from marinade, but don’t discard! 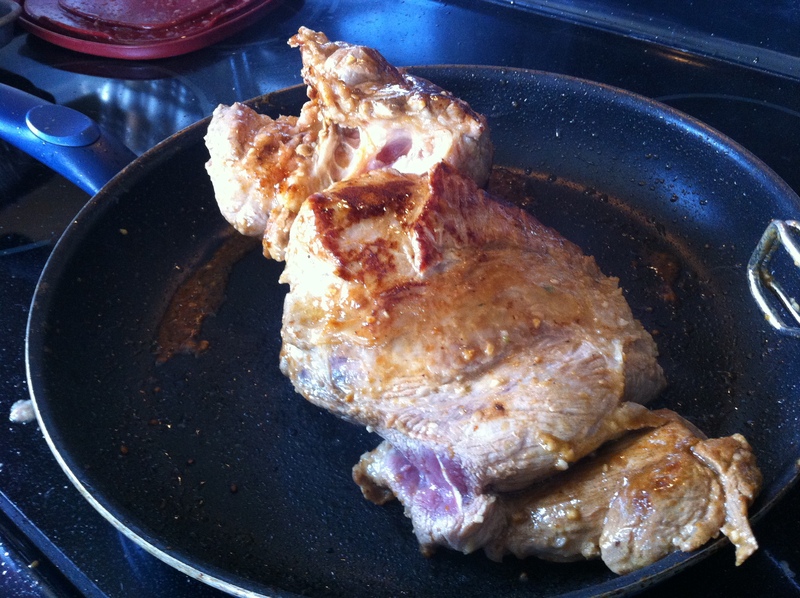 Sear the pork in a lightly oiled pan or skillet (save that pan for later!) on all sides. It will lose all the marinade at first and get really bubbly. Don’t worry. Just let it get crispy on all sides. The juices will evaporate. Place the pork in a roasting pan and pour the marinade on. Tent the roasting pan with foil to seal in the steam. Place the roasting pan into the oven and cook for 45 minutes. 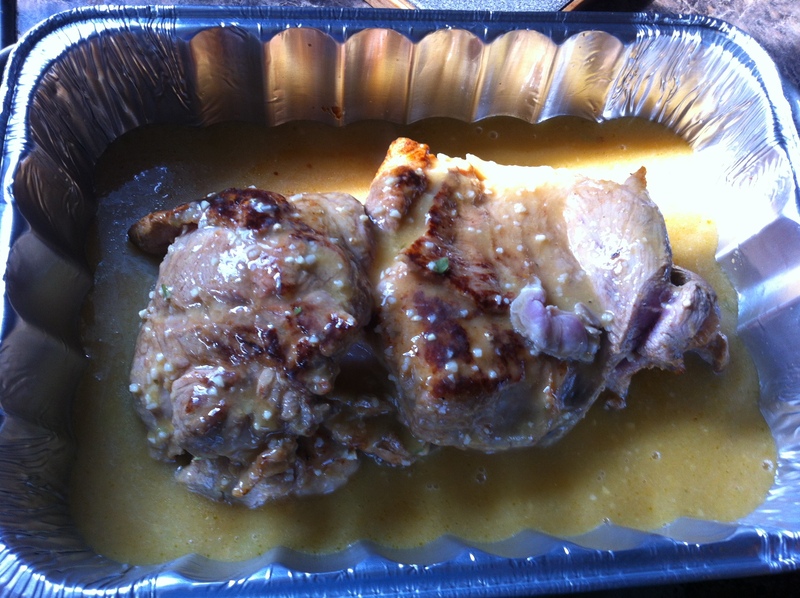 Then uncover and cook for at least 1 hour and 30 minutes, basting as needed and flipping the meat over half way through. We ended up cooking it for a little over two hours. The longer the better. Let the meat rest for at least 10 minutes before cutting. When you put the pork in the oven, you can prepare garlic mayo by peeling 8 cloves of garlic (we left them whole, even though the original recipe called to chop the garlic). 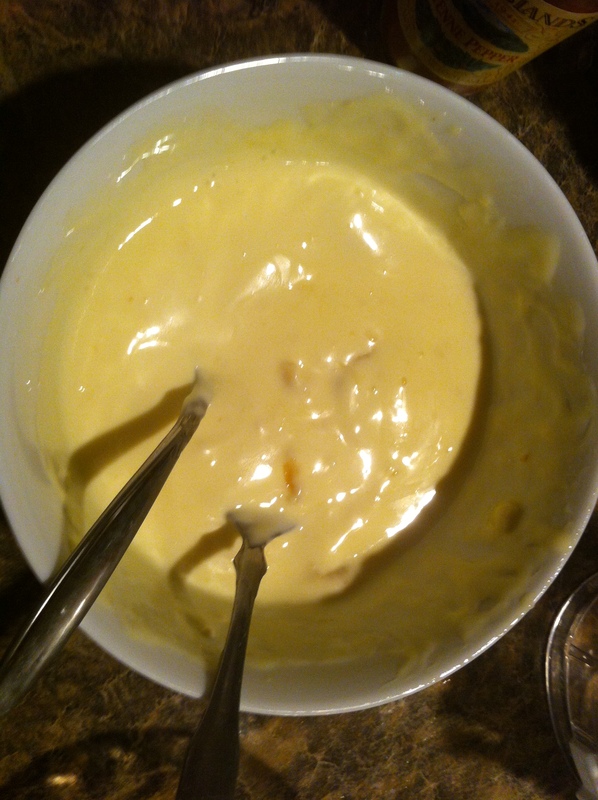 Put the garlic in an oven proof custard dish and pour about 2 tablespoons of lime juice on top of the garlic. Add to the oven with the pork and cook for about 30 to 45 minutes or until the garlic is soft and roasted. Add this to 1 cup of mayonnaise. Add 2 tablespoons olive oil, 2 tablespoons lime juice and stir. The original recipe called for relish, but we left that out. While the meat is roasting, cut up the onions yellow onions into wedges. We went with strips in the food processor and it wasn’t quite right. Place in the same pan that you seared the pork shoulder in and set to medium high heat. Cook for about 10 minutes or until onions are caramelized and have picked up all of the fond. Cut bread in half. Slather garlic mayo on both sides and place in toaster oven till the mayo puffs up a bit and the bread slightly browns. Last step, assemble the sandwich by adding a little more mayo on the bread, topped with romaine leaves, onions, pork, a few pickled jalapeños and some cilantro. 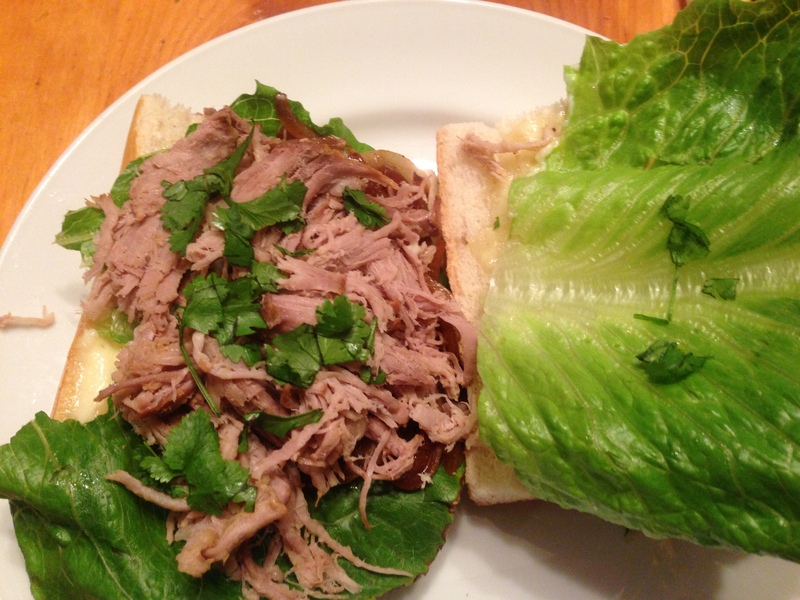 Three pounds of pork made five sandwiches the first night. We opted to freeze the rest, which will make at least four more sandwiches. Plan for a feast. It’s just as tasty cold the next day. I only wish I’d had a few more pickled jalapeños to add a bit more heat. In college, J and I practically lived on jambalaya and coffee. Of course, it was the boxed version and after eating it for two years, we got pretty burned out. Which was sad because jambalaya is so tasty and easy and perfect for a chilly evening. 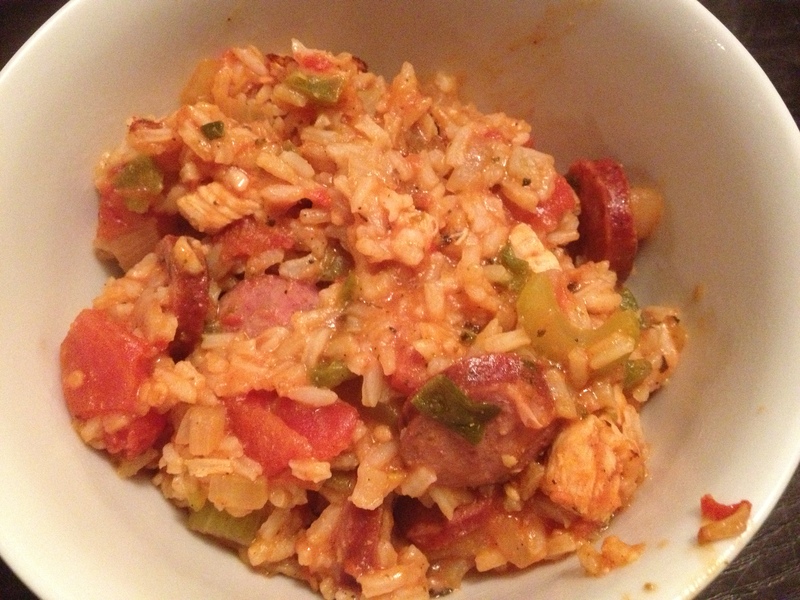 Luckily, J found this jambalaya recipe and with a few tweaks cured the burnout. Cook sliced sausage over medium high heat in a 6 quart stock pot until slightly browned, about 5 minutes. Add bell pepper, onion, celery, garlic and scallions and cook until softened but not translucent, about 4 minutes. Add cubed chicken breast and Worcestershire sauce and cook just until you can no longer see pink. Add the bay leaves, basil, oregano, sage, paprika, Tony Chacere’s, salt, black pepper, tomatoes and chicken broth. Bring to a boil over medium high heat. Add rice, bring back up to a boil. Boil for 1 minute. Cover and reduce heat to low, simmer for 30 minutes. The jambalaya should still be wet, but not soupy. Remove the bay leaves. Enjoy! We’ll be adding this back to our regular dinner rotation. It was super easy to make and make more than enough to freeze half for a later meal. If you told me 10 years ago, I’d be eating squash, I would never believe you. But I am! And I’m loving it! I had no idea these fall vegetables could taste so lovely! I’m always looking for new recipes and when a friend recommended this Self Magazine butternut squash recipe, I jumped at the chance to try it. It was super easy (once I figured out how to cut the squash) and very filling. Cook penne as directed on package (we used spaghetti because we were out of penne, it worked just as well!). Heat oil in a large skillet over medium heat. Fry sage, turning once, until crisp on both sides, about 1 minute per side. Transfer to a paper towel. Add onion and garlic to skillet. Cook, stirring frequently, until soft and golden, about 3 minutes. Add squash, 3/4 cup water, salt and pepper. Cover and simmer, stirring occasionally, until squash softens, 5 to 7 minutes (this took about 10 minutes for us). Drain pasta, reserving 1 cup cooking water. Return pasta to pot and add squash mixture; stir over low heat, adding some reserved cooking water if necessary, until pasta is coated, about 1 minute. Serve, garnished with cheese and sage. 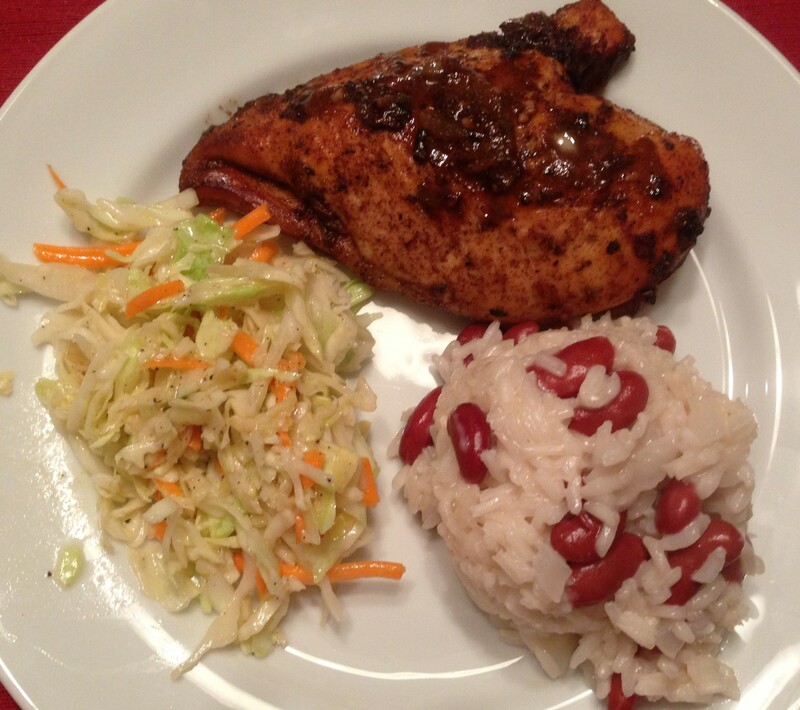 I didn’t expect this simple dish to be as flavorful and wonderful as it was. The only two changes I’ll make are to add more onion and garlic. A great late fall early winter dish. 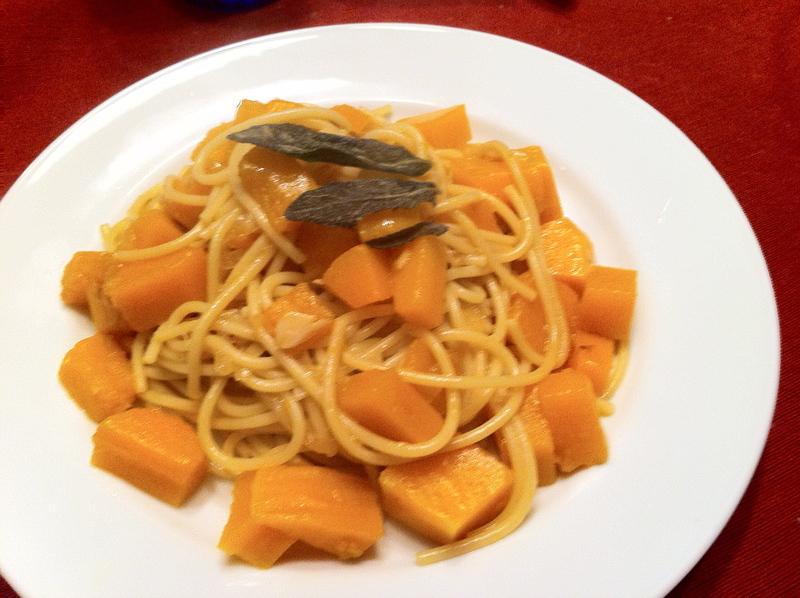 Not to mention a wonderful introduction to the world of butternut squash. What new vegetable should we try next? Parsnips?